We have been growing the reliable small shrub for over 10 years, and Polygala chamaebuxus var. grandiflora never fails to reward us with flowers from mid winter right through spring. It is listed as Polygala chamaebuxus ssp. grandiflora as well as simply Polygala chamaebuxus grandiflora, no matter the name it is a great little plant. An excellent low growing evergreen perennial for the rock garden, garden border or container is Polygala chamaebuxus grandiflora. 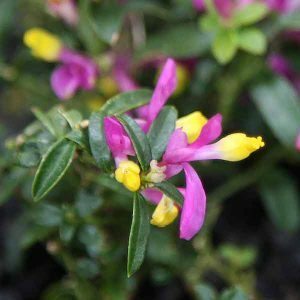 Flowering from spring through summer with wonderful purple to pink and yellow flowers, Polygala chamaebuxus grandiflora does appreciate a little protection from the afternoon sun. Main flowering period is in spring, with a little care, fertiliser and water, it may put on a second flush of flowers in summer. Sometimes called the Box Leafed Milkwort, it comes from the mountains and does prefer a slightly acidic soil. This is a low growing species that will usually reach no taller than 10 -15 cms, require little to no pruning other than a tidy up to shape and responds well to a liquid seaweed based fertilizer in spring. Grow in a humus rich moist but well drained soil. Unfortunately this is not a plant readily available in Australia. However it can often be found at Plant Fairs and sometimes at the Ferny Creek Horticultural Society flower shows. Propagation is easy, best from cuttings taken in summer. As for Polygala chamaebuxus grandiflora nana, no such plant, the species is a dwarf already. And Polygala myrtifolia ‘Grandiflora is a different plant altogether.